Ortigas Center is home to many skyscrapers, shopping malls, hotels, restaurants and night clubs. It is the second most important business district in Metro Manila, after Makati. Going to a particular spot, for example, a building in this bustling commercial center is very confusing especially if you come from a far distant part of our metropolis. Terminal of jeepneys that ply the route of main thoroughfares inside the central business district is way too far from the nearest MRT-3 Station which is Ortigas. To solve the problem, I explored the north part of Ortigas Center to find possible walking directions from MRT-3 Ortigas Station to numerous buildings here. And I found out it's faster to reach these locations if you walk via a short road named Guadix Drive. If you're riding a train that comes from Taft Station, after you alight, turn left from turnstile (exit machine) and go down the station via stair located to the north part of the station. If you turn right from turnstile, the stair will take you to the ground going to SM Mega Mall. If you're riding a train that comes from North Station, use the footbridge located beneath the station and go to the other side of the station which is EDSA's northbound lane. Go down the station via the only stair to the left of the footbridge. 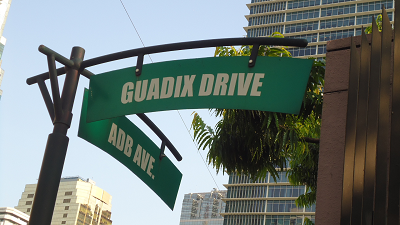 The signpost tells you that you're at the corner of Guadix Drive and ADB Avenue. We start the tour here. 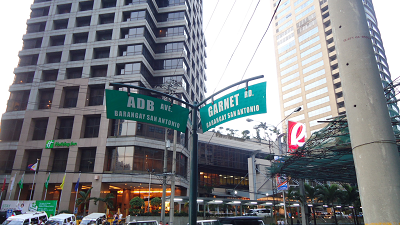 If you turn right onto ADB Avenue, first place you get to is the Visitors' Entrance of Asian Development Bank or ADB. Opposite ADB Headquarters is Joy-Nostalg Center, home of Oakwood Premier. Next to ADB Headquarters is a parking lot, and next to it is The Podium, an upscale shopping Mall. To the other side of ADB Avenue, next to Joy-Nostalg is Yamaha Y Zone, located at the corner of ADB Avenue and Opal Road. Situated at the opposite corner of ADB Avenue and Opal Road is The Malayan Plaza. 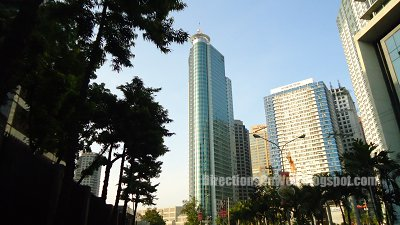 Next to The Malayan, along ADB Avenue, is Anson's Ortigas, followed by Discovery Suites and next to Discovery Suites is JMT Corporate Condominium. El Peublo Real follows, located at the corner of ADB Avenue and Julia Vargas, being bordered by a slip lane from Julia Vargas to ADB Avenue. Going back to our point of origin, at the corner of Guadix Drive and ADB Avenue, to your left, you'll get to see this skyscraper. 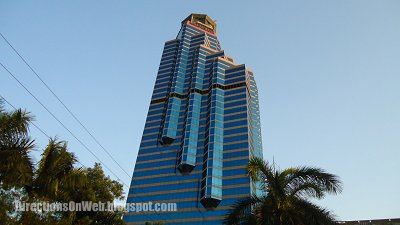 This is Robinson's Equitable Tower, located along ADB Avenue, border by slip roads to its two sides. Walk towards the front of Robinson's Equitable Tower and you'll get to see Holiday Inn, still along ADB Avenue, next to Robinson's Equitable Tower. Holiday inn is connected to Robinson's Galleria Mall, with its entrance along ADB Avenue next to Holiday Inn, and after the main entrance of Robinson's Galleria is the Crowne Plaza Hotel, situated at the corner of ADB Avenue and Ortigas Avenue. To the other side of ADB Avenue, opposite Robinson's Equitable Tower is Mega Plaza, situated at the corner of ADB Avenue and Garnet Road. At the opposite corner of Garnet and ADB Avenue is AIC Burgundy Empire Tower, which is also borders to the north by another street called Sapphire Road, from which Corinthian Executive Regency is located. Walking along Garnet Road from the corner of ADB Avenue, next corner is Topaz Road, where Greenhills Christian Fellowship is located. Next to Greenhills Christian Fellowship along Topaz Road is East of Galleria. Back to Garnet, opposite Greenhills Christian Fellowship is AIC Grande Tower. And the next street to the right is Ruby Road, where Grand Emerald Tower is located. 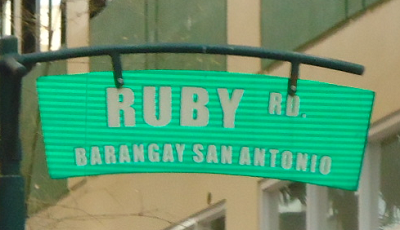 Entering Ruby Road, you'll get to Jollibee Plaza, to the left of Ruby Road. Aside from Garnet Road and Ruby Road, Grand Emerald Tower is also being bordered by a main street called F. Ortigas Jr Road. Situated at the other corner of Garnet and Ortigas Jr is AIC Gold Tower. If you turn left from Garnet to the north of F. Ortigas Road, which is actually going northeast, you'll be heading to the intersection of Sapphire Road and F. Ortigas Jr. Walk across F. Ortigas Road to get to the opposite corner, the one to the left, where a McDonald is located. Next to McDonald along Sapphire Road is Ortigas Building. And further towards the opposite end of Sapphire Road, left side, another skycraper called Unionbank Plaza stands magnificently. These are only a few of the many buildings within Ortigas Center. I considered them to be at walking distance from Ortigas Station of MRT-3 because there's no public transport system going directly to their locations from MRT. 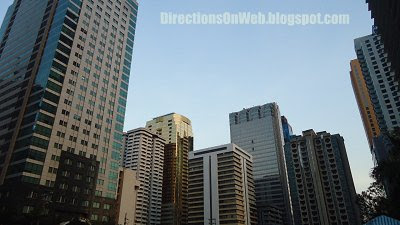 This post is only a part of series of articles on how to get to buildings located inside Ortigas CBD by means of commuting. We will cover all buildings as well as nightlife destinations as we discover what's the best way to get to their locations. You can print this article and use it as guide in going to a building listed here. Just click the "Print this article" at the bottom of this post (below Share icons). If you have any comments, just click here. Hi, loodec, thank you and welcome to our blog. Rest assured that you will learn a lot from here. I also installed Google Friend Connect for your convenience. Hello there! I just wanted to ask directions from Robinson's Galleria to Eton Cyberpod E-Life Building 1 by foot. I know it's not that far but don't know if I can just cross the street or there are foot bridges or exits from Robinsons that I can go thru to get there. Thank you in advance. P.S. What if I come from Greenhills Christian Fellowship (going to Eton Cyberpod E-Life Building 1)? Thank you again. @ Nikka chan. Yes you can walk across Ortigas Ave from Robonson's Galleria to Eton Cyberpod. Just use pedestrian lane. If none, use the one located at the corner of Edsa and Ortigas Ave which is connected to Robinson's Galleria. @ elaine woot. Take Guadix Dr and you get to see ADB visitors' entrance to the right. hi lag alag.. I saw this post. pero nalilito pa rin po ako kung pano po makapunta sa jollibee plaza from cainta?... sakay po ako ng jeep from robinson galleria then dadaan na po ba yun? @ joyce27. Here's how to get to Jollibee Plaza from Cainta. Take a bus bound for Quiapo and alight at Robinson's Galleria. Cross Ortigas Ave and wait for a jeepney with "Ortigas Complex-Robinson's Galleria" sign on its sides. It will pass along the side of Robinson's Galleria, just wait for it. The jeepney will take Ortigas Ave and it will turn right onto F Origas Jr Rd. You must get off the jeepney before it turns left onto Garnet Rd. 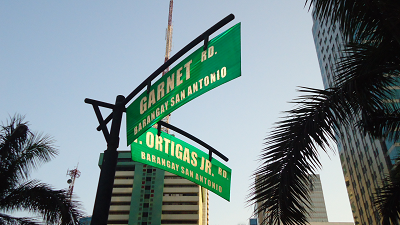 Now, walk along the right side of F Ortigas Rd away from Garnet. You will see Jollibee Plaza at the right side of F Ortigas Rd. It's a tall building and the sign that reads Jollibee Plaza is very visible. @ joyce27. You are welcome. Yeah, sure, no problem. I would like to ask if how to get in 102 emerald mansion ortigas center pasig city.im from caloocan so i will take MRT for transportation.I'll go there by tommorrow.please help me.thank you. How To Commute From EDSA To Buildings Inside Ortigas Center. Emerald Mansion is mentioned there. I would like to ask if how to get in ansons centre ortigas pasig city.if i came from robinsons galleria.I'll go there by tommorrow.please help me.thank you. Walk on the left sidewalk of ADB Ave from Robinsons and you will immediately see it. hi.. i would like to ask if CW Home Depot is in walking distance from Robinsons Galleria? It's far, located at Meralco Ave cor Julia Vargas. Best to walk from Ortigas Ave cor Meralco Ave.
Hi.ask from Shaw to emerald building?? It's written in the post. Please read, thanks. How will i get to Cyberscape Alpha Building from Rob. Galleria? thanks. You forgot to give exact address. Hi Lag alag, how do I get to Robinson Cyberscape Alpha, Sapphire and Garnet road from Dasma Cavite? Thank you. Bus to Baclaran. City bus to north of MM with secondary sign of "Ortigas Ilalim", get off at Robinson Galleria, get inside Robinson Galleria, exit at the other end, cross ADB Ave and enter either Garnet or Sapphire street.